Back in January 2014 BTN Interviewed David Dingle, chief executive of Carnival UK, whose parent company is the owner of P&O, Cunard, Holland America, Princess and Seabourn and in total 10 cruise lines. Mr Dingle’s responsibilities cover Cunard and P&O. Was he concerned regarding the arrival of Britannia, due the following year, and a capacity rise of 24% in the British market by P&O? Clearly not. No figures are out yet but 2015 may well have been a record year for the cruise market with nearly 19,000 berths added to the worldwide cruise portfolio. P&O UK is staying where it is for 2016 but elsewhere there is a record amount of new capacity. Most of the cruise lines noted here in BTN will be exhibiting at the London Cruise Show hosted at Olympia 20-21 February. We are able to offer a very special price of just £2. If nothing else it provides an opportunity to collect all the latest brochures in one go! Tickets are £10 at the door. Book online www.cruisingshow.co.uk quote 'E1' to claim the discount, or by calling +44 (0)871 620 4024. There are no parking restrictions on the Sunday. Using Douglas Ward’s Berlitz Cruising and Cruise Ships 2016 this year will see 10 new ships arriving and the astonishing addition of 27,000 beds to be filled every single week around the globe. From a practical point of view it is 11 with Crystal Esprit joining the ranks 20 December 2015 at Eden Island Marina in Mahé, Victoria, Seychelles. One thing for sure the new ultra-luxury Crystal yacht will not affect the total numbers with just 31 suites. It even has a submarine for aqua exploring. The cruising market seems to be growing in two distinct ways. Very large resort ships, a sort of floating theme park with accommodation, or a quality product, much smaller and often food orientated, which does not really have a land-based comparison. 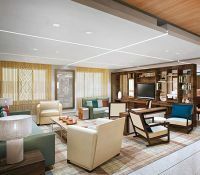 Few hotels offer coaching kitchens or an in-house theatre. For the summer Mediterranean season sea days are now very limited and with ships not leaving port until late in the evening. If you want sea days it is a Atlantic positioning crossing or part of a world cruise section. 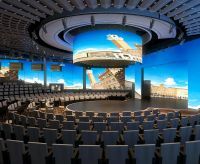 The new cruise ship includes many favourites from its sisters, such as a seven-"neighbourhood" concept that creates themed areas like "Entertainment Place" and the "Pool and Sports Zone" and a 10-storey spiral slide called "The Abyss." 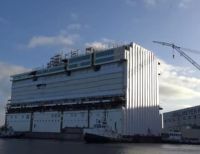 Wi-fi, similar to the very quick system on Anthem of the Seas, is also being fitted and passengers will quickly get used to wristbands to operate the cabin doors and to pay for on-board purchases. For whatever reasons the Germans are not that keen on adventurous names for their cruise ships and this latest vessel, near identical to the already in service Mein Schiff 4, is due to make her maiden voyage out of Kiel next July. She will visit Southampton as part of her summer programme. The third ship in Royal Caribbean's innovative Quantum Class is aimed at the growing Asian market. Like its sister ship, Quantum of the Seas, Ovation of the Seas will homeport in Tianjin (China), though the 4,180-passenger cruise ship will sail four Australia and New Zealand itineraries from December 2016 to January 2017. 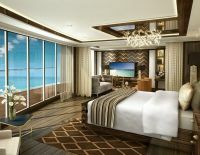 Regent Seven Seas says its new cruise ship, Explorer, will be the most luxurious vessel ever built. The last Regent Seven Seas introduction, Voyager, was in 2003. At this five-star level it is difficult to compare ships but all accommodation is called “ suite”, and even the smallest come it at 212sq ft – large by cruise industry standards. The ship includes six restaurants, as well as a Culinary Arts Kitchen, a first for the line. Passengers can hone their cooking skills at the state-of-the-art show kitchen where they'll receive hands-on instruction in areas like cooking the perfect fish or French techniques. Foodies will love the ship's Gourmet Explorer Tours, which pair shore excursions with food and wine tastings in a small-group setting (12 to 18 passengers maximum). Prices include airfare, dining, drinks, gratuities and an excursion in every port. The premium Carnival brand Seabourn has spent the past two years selling off its three oldest ships. The upside has been consistency among its remaining vessels, as well as a clear plan of expansion, which begins with Seabourn Encore its largest to date. Much of the excitement around Seabourn Encore centres on dining – specifically on a new partnership with world-famous Chef Thomas Keller, known for his three Michelin-starred land-based restaurants: The French Laundry, Per Se and Bouchon. With Keller, Seabourn creates a signature restaurant onboard Encore that features high-quality ingredients and innovative dishes. Viking Sea is a sister ship for Viking Star successfully introduced by the river cruise market leader last year. Upmarket the ships replicate all that Viking has offered over the years including as part of the package shore excursions complimentary beer, wine and soft drinks served at lunch and dinner, plus wi-fi.